Happy New Year, friends! I’m starting this year’s posts off with one of my favorite things I’ve been making for the past few months — homemade lo mein! I know some people have goals this new year to eat more meals at home, to eat healthier, or to spend less money on takeout, so this is a perfect time to share this recipe — it can take care of all three of those! And flavor-wise, this lo mein is SO wonderful. It tastes amazingly like the lo mein I get from my favorite Chinese take-out places, but brighter, fresher, and lighter. And, for me, there’s something about knowing all the ingredients that went into your meal that make it even more satisfying and delicious. One great thing about this recipe is how adaptable it is. If you want to make it with a different protein, like shrimp, pork, or chicken, please do! Just keep the amount of protein the same (roughly 1 pound) and you’ll be good to go. The same goes with the vegetables — I used ones that my family and I like the most, but you can change them up highlight the veggies you prefer. 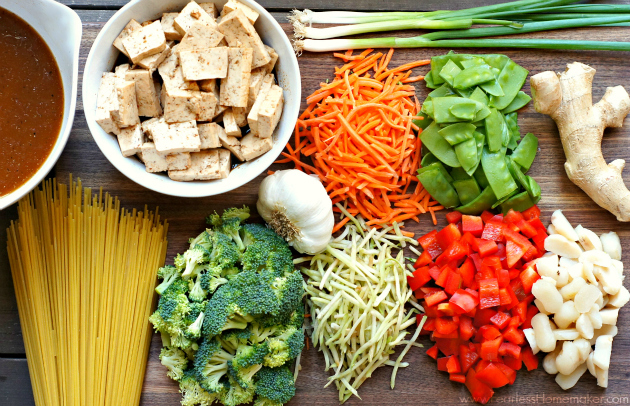 Stick to about 7 cups of vegetables to keep the ratio of vegetables to protein to sauce to noodles the same, and you’re all set! Finally, I must say that the leftovers of this lo mein are FANTASTIC. While I love it fresh out of the skillet, it’s just as scrumptious as a quick leftover lunch, and for me, you cannot beat a speedy, homemade, easy-to-reheat lunch. Happy cooking in 2016, friends! In a medium bowl, combine the pressed/sliced tofu with 2 teaspoons of white sugar, 1 tablespoon rice wine vinegar and 1/4 cup soy sauce. Mix this together gently to coat the tofu well. Cover and let marinate in the refrigerator for at least 1 hour. In another medium bowl, make the sauce: Combine the remaining 2 teaspoons sugar, remaining 1/2 cup soy sauce, vegetable broth, water, sesame oil and ground black pepper. In a separate small bowl, dissolve the cornstarch with about 2 tablespoons of this sauce mixture and slowly add back to the bulk of the sauce, stirring well. Set the sauce aside. Meanwhile, heat a large pot of salted water until boiling. Cook the noodles until al dente, drain, and set aside. Heat 1 tablespoon of vegetable oil in a wok or large skillet over medium-high heat. Add the marinated tofu and stir-fry for 6-8 minutes, stirring occasionally, until well-browned. Transfer the tofu and any remaining juices to a warm plate. Add 2 more tablespoons of vegetable oil to the wok/skillet, and saute garlic, ginger, and green onions for about 2 minutes, until mixture is fragrant. Add the carrots, cabbage, broccoli, sugar snap peas, red bell pepper, and water chestnuts to the pan, and cook on medium-high heat for 4-6 minutes, stirring frequently, until vegetables are crisp-tender. Add the sauce mixture, cooked pasta, and cooked tofu to the wok/skillet and simmer until the sauce thickens to your desired texture, about 2-5 minutes. Serve immediately, stopped with extra sliced green onions, if desired. Mmm so much colour and flavour! This looks great! I love this!! So many fresh, colorful ingredients. Lots of nutrients for the new year! Yum! I have never made my own lo mein but this looks like one I need to try. I haven’t had lo mein in years and your recipe looks and sounds great! So much flavor here, and lots of good texture. I bet this is wonderful, and we too are trying to spend less on dining out and takeout. We were adding up what we spent in restaurants, and it really was out of hand. Boy, does it ever add up! Best wishes for a delicious and thrifty 2016! What a delicious way to start the new year! This sounds so tasty and healthy – and if the leftovers are great, it’s a win-win! 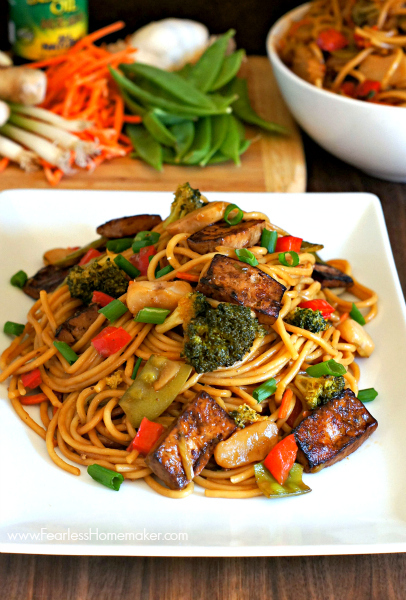 We like to use tofu every now and then and this dish looks like a perfect way to do so! We made this lo mein this past Friday and it was great! We doubled it and I’ve been loving the leftovers. Actually used brussels sprouts instead of cabbage too. I’m thrilled you liked it, and what a great idea to use brussels instead of cabbage – smart! The leftovers ARE great, aren’t they? What drinks are suitable for accompany this food?